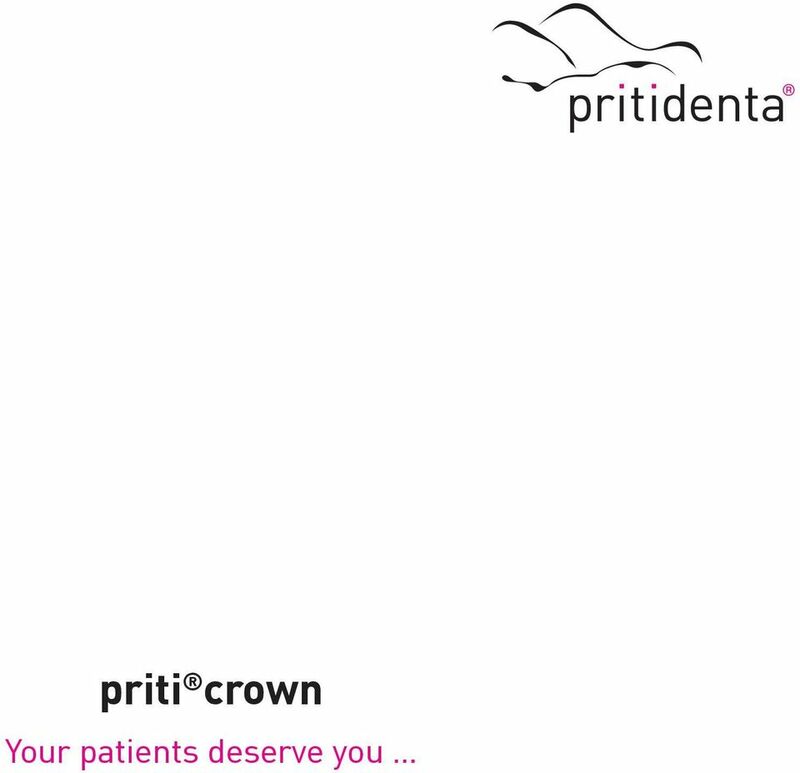 Download "priti crown Your patients deserve you"
7 Clinical studies 7 For over twenty years, studies have been documenting the long-term success of the material There are 25 million reasons for using this material, since this is the number of patients who have already been fitted with it. Thanks to its excellent material properties, it is extremely easy to grind and also polishes well. 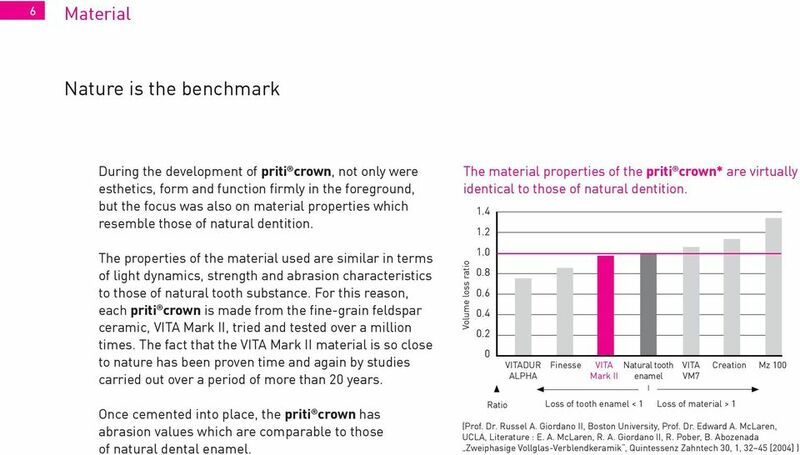 In a separate study by Bindl and Mörmann, molar crowns made from VITA Mark II showed a success rate of 97% over the duration of the three and a half year study. 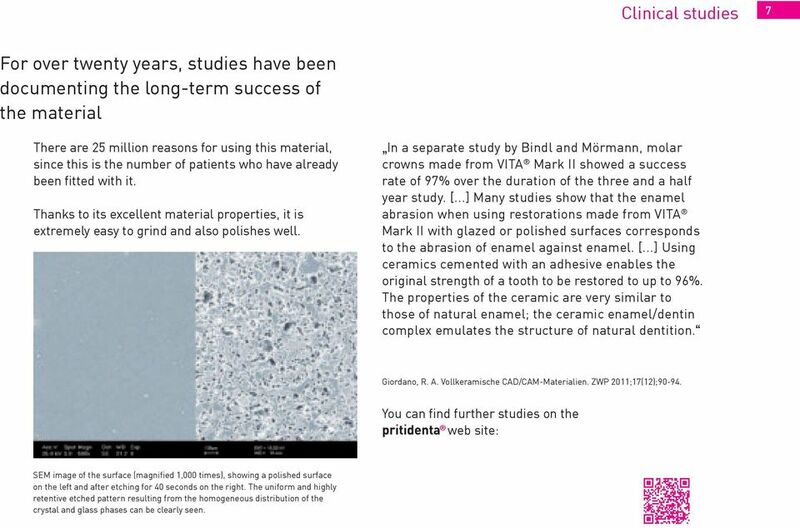 [...] Many studies show that the enamel abrasion when using restorations made from VITA Mark II with glazed or polished surfaces corresponds to the abrasion of enamel against enamel. [...] Using ceramics cemented with an adhesive enables the original strength of a tooth to be restored to up to 96%. The properties of the ceramic are very similar to those of natural enamel; the ceramic enamel/dentin complex emulates the structure of natural dentition. Giordano, R. A. Vollkeramische CAD/CAM-Materialien. ZWP 2011;17(12); You can find further studies on the web site: SEM image of the surface (magnified 1,000 times), showing a polished surface on the left and after etching for 40 seconds on the right. The uniform and highly retentive etched pattern resulting from the homogeneous distribution of the crystal and glass phases can be clearly seen. 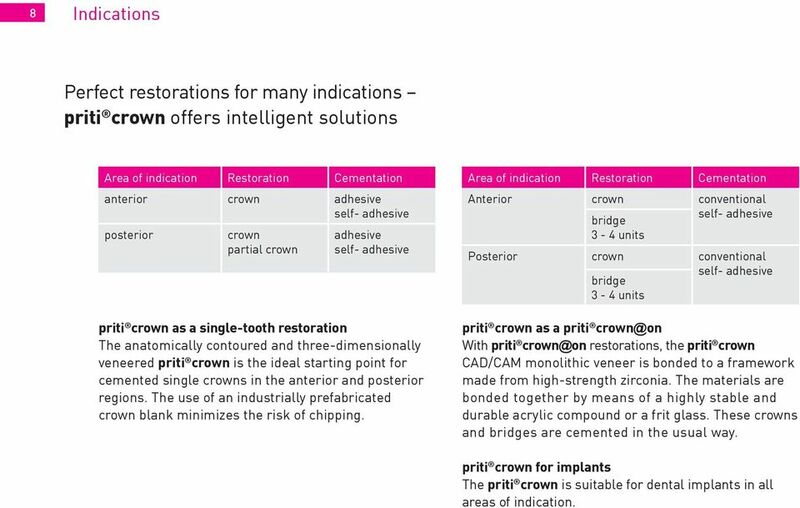 8 8 Indications Perfect restorations for many indications priti crown offers intelligent solutions Area of indication Restoration Cementation anterior crown adhesive self- adhesive posterior crown partial crown adhesive self- adhesive priti crown as a single-tooth restoration The anatomically contoured and three-dimensionally veneered priti crown is the ideal starting point for cemented single crowns in the anterior and posterior regions. 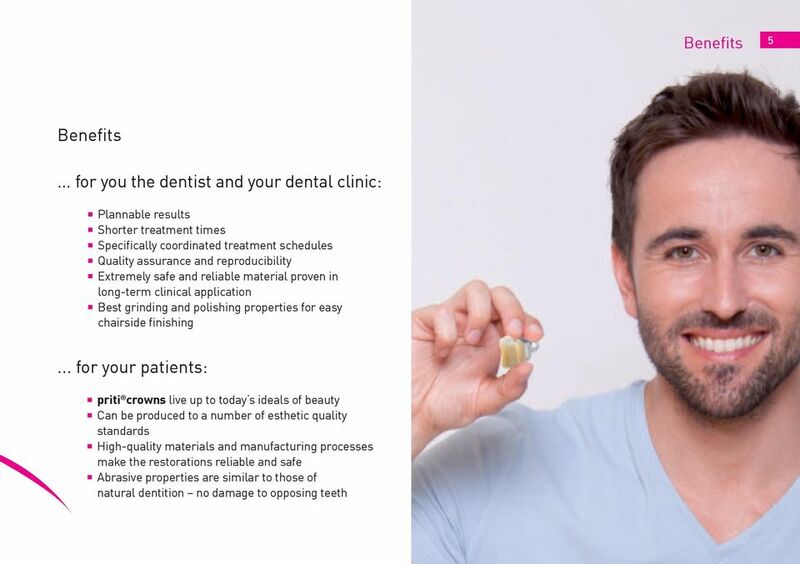 The use of an industrially prefabricated crown blank minimizes the risk of chipping. 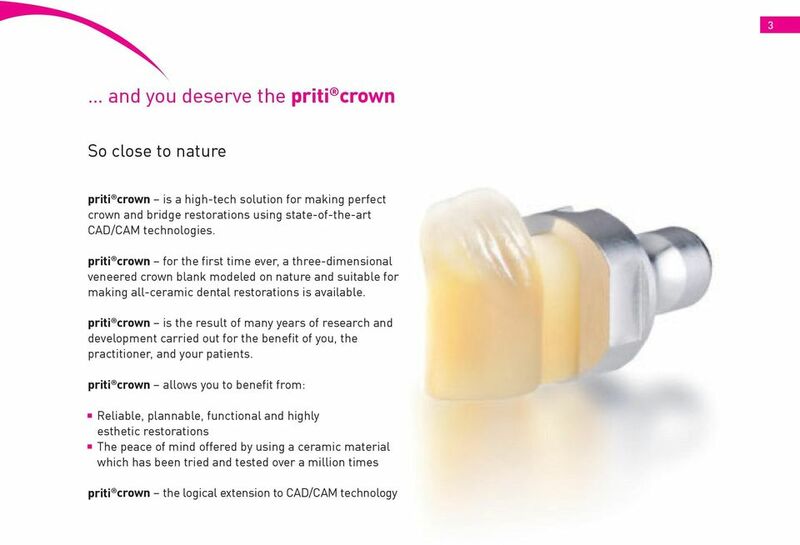 Area of indication Restoration Cementation Anterior crown conventional bridge self- adhesive 3-4 units Posterior crown conventional bridge self- adhesive 3-4 units priti crown as a priti With priti restorations, the priti crown CAD/CAM monolithic veneer is bonded to a framework made from high-strength zirconia. The materials are bonded together by means of a highly stable and durable acrylic compound or a frit glass. These crowns and bridges are cemented in the usual way. 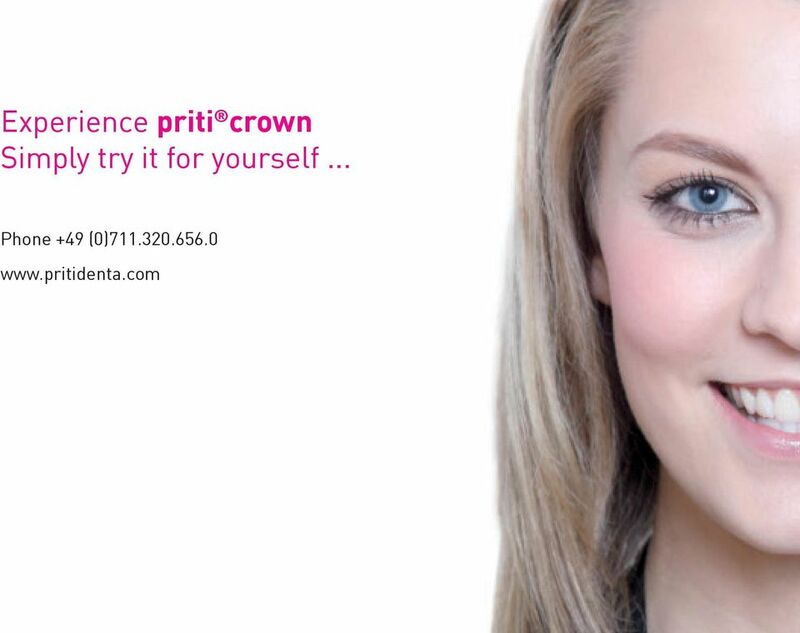 priti crown for implants The priti crown is suitable for dental implants in all areas of indication. 10 10 Self-adhesive cementation Before taking the impression, tooth 22 was fitted with a tooth-colored abutment. After manufacturing and checking the esthetics and fit of the priti crown, the tooth stump was cleaned and prepared for self-adhesive cementation. 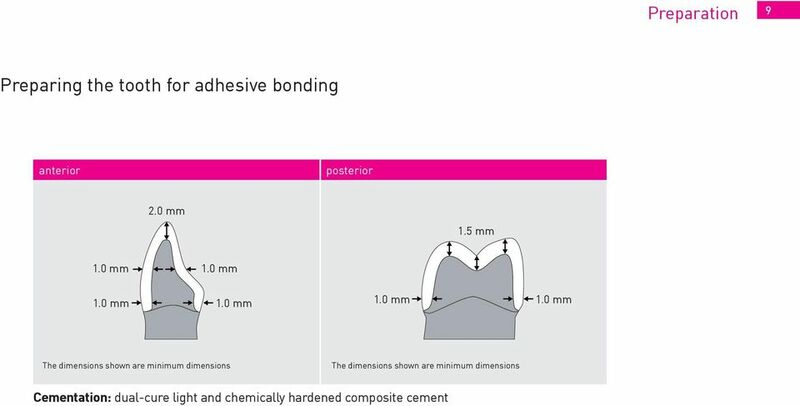 The priti crown was etched for 60 seconds with a 5% solution of hydrofluoric acid and then rinsed out well with water, dried and silanized with a suitable bonding agent. * The prepared tooth stump is first coated with a primer*, then the appropriate adhesive* is applied. 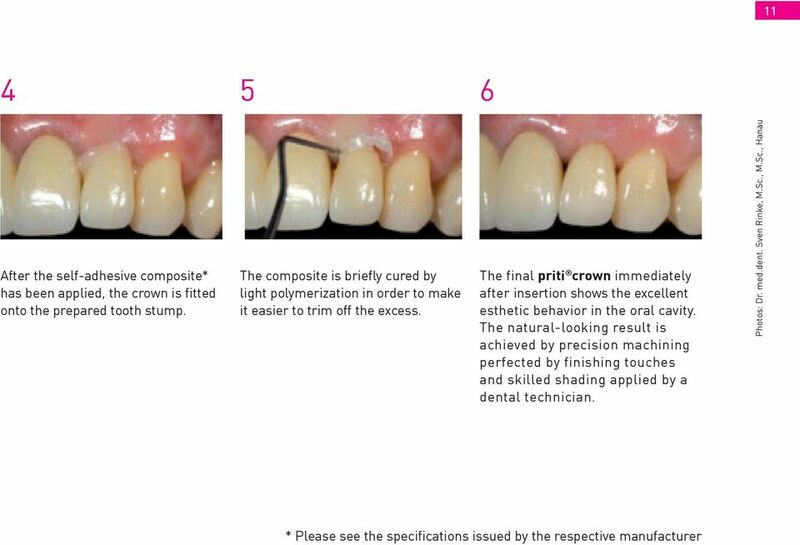 12 12 priti Because of the difference in size among the individual stumps and the partly non-vital remaining tooth substance, it was decided in this case to make priti crowns using the priti Four zirconia copings in the shade A3 form the basis of the priti used here. 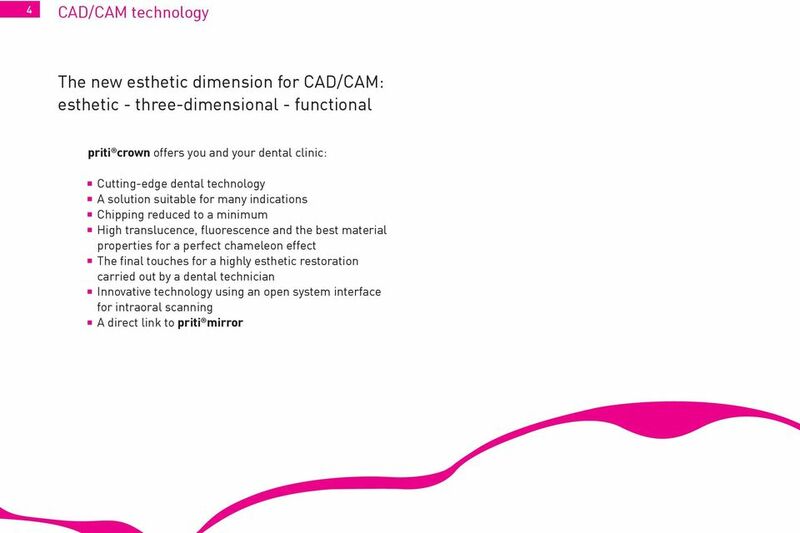 Then four priti crowns were designed and ground using CAD technology to produce a perfect fit. The result after fitting and veneering the priti crowns. After cementing the priti crowns onto the zirconia copings, the margin areas are tapered and polished to a high luster. 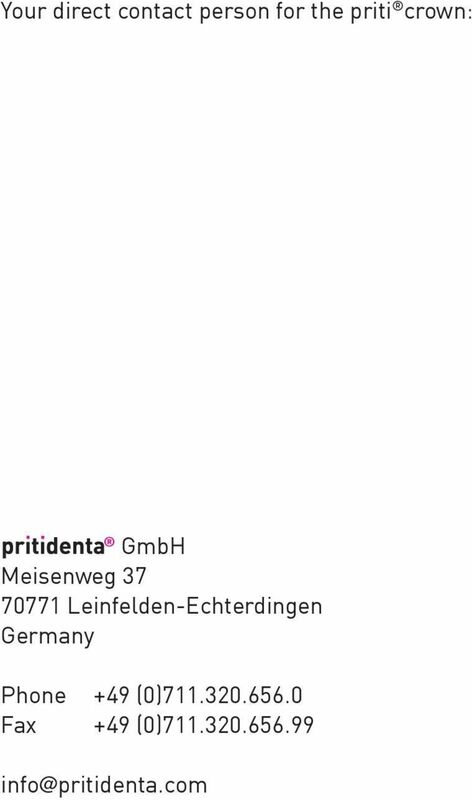 14 14 priti mirror The next dimension Give your patients added confidence: Seeing the results of the restoration during consultation makes it much easier for them to reach a decision. 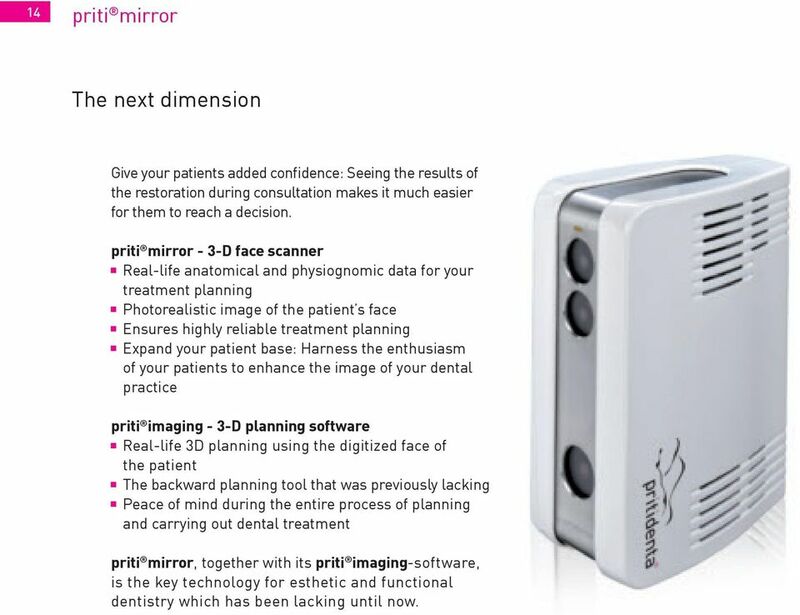 priti mirror - 3-D face scanner Real-life anatomical and physiognomic data for your treatment planning Photorealistic image of the patient s face Ensures highly reliable treatment planning Expand your patient base: Harness the enthusiasm of your patients to enhance the image of your dental practice priti imaging - 3-D planning software Real-life 3D planning using the digitized face of the patient The backward planning tool that was previously lacking Peace of mind during the entire process of planning and carrying out dental treatment priti mirror, together with its priti imaging-software, is the key technology for esthetic and functional dentistry which has been lacking until now.